When engineered to use a four-billion-year-old version of the protein thioredoxin, the bacteria can stall bacteriophage replication, a new study shows. 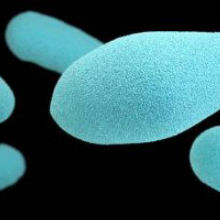 CDCResurrecting ancient proteins in modern E. coli can protect the bacterium from viral infection, scientists reported today (May 9) in Cell Reports. Researchers from Spain engineered the genetic sequences that code for ancestral forms of the protein thioredoxin—including one that would have existed about 4 billion years ago—and found that not only did the old protein function in the cells, but when these bacteria were exposed to the bacteriophage T7, they fended off viral infection. The project got its start from an interest in plants. Specifically, Asunción Delgado and colleagues at the University of Granada knew that proteins in plants that aid viral replication haven’t evolved so much so that they can avoid being hijacked by viruses. So, the team wondered whether a different version of a protein, possibly an ancestral form, could keep an organism alive but prevent viral replication. 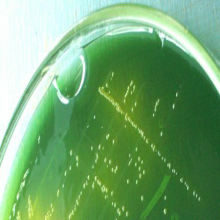 Thioredoxin was a good test subject: it is found in all modern organisms and is essential for both hosts and invading viruses. 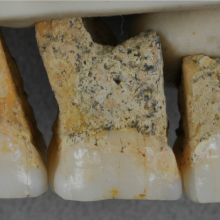 In the new study, Delgago and colleagues studied the genetic sequences of a range of microbial organisms, traced their ancestry, and identified the sequences for ancient thioredoxins, dating from 1.5 billion to 4 billion years ago. 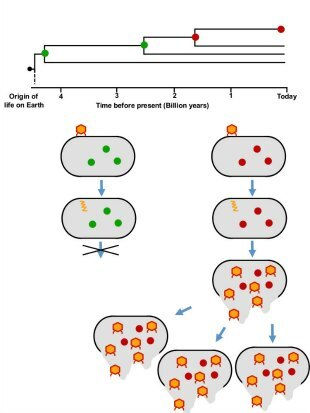 Ancient versions of the thioredoxin protein (green circles) don’t allow viral DNA to replicate, but the more modern versions (red circles) do. DELGADO ET AL.In E. coli, thioredoxin circulates electrons to keep vital chemical reactions going. 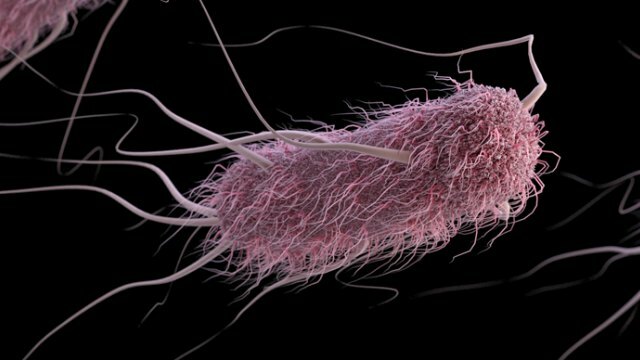 When the team replaced the modern thioredoxin gene in E. coli with ancient sequences, the resulting proteins too moved electrons around, with varying degrees of success. 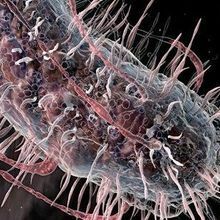 The oldest version didn’t work as well as the more recent ones; but the fact that it dated back to the origin of life itself and still kept the E. coli alive was surprising, said chemist Jose Sanchez-Ruiz, the paper’s senior author, in an interview. The team then mixed the altered E. coli with bacteriophage T7, which normally recruits thioredoxin in bacteria for help in DNA replication. “The virus inserted its DNA into the bacterium without any trouble. But, when the virus went to recruit thioredoxin for its own purposes, that was a problem,” Sanchez-Ruiz said. Thioredoxins that were roughly 2.5 billion years and older couldn’t be used by the virus for DNA replication. The team also tried the experiment with the human form of thioredoxin, which prevented the virus from replicating, too. Swapping a protein essential to both the host organism and the virus infecting that organism could confer viral resistance. The strategy could be applied to boosting plants’ resistance to viruses, Sanchez-Ruiz said. A. Delgado et al., “Using resurrected ancestral proviral proteins to engineer virus resistance.” Cell Reports, doi:10.1016/j.celrep.2017.04.037, 2017.